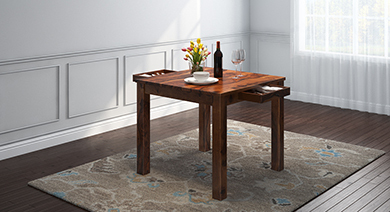 Add a dash of style to your dining room with an impeccably designed dining table set. Urban Ladder presents 4 seater dining table sets in a range of stylish designs. The level of comfort and durability of Urban Ladder's 4 seater dining table sets is truly enthralling! 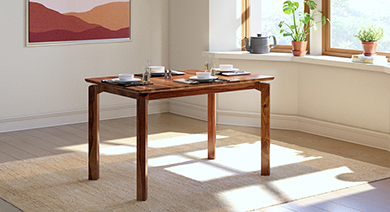 Explore an amazing range of beautiful dining table sets online. 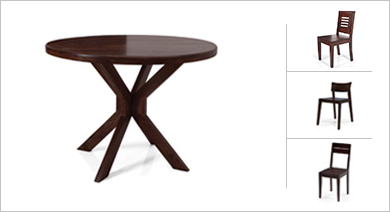 Find a comprehensive selection of 4 seater dining table sets by shopping online at Urbanladder.com. Your dining area is one of the most important spaces in your home. It is where bread is broken each day, your family bonds over a meal, and you entertain dinner guests. It is a place for conversations and great food, a hub of activity in your home. 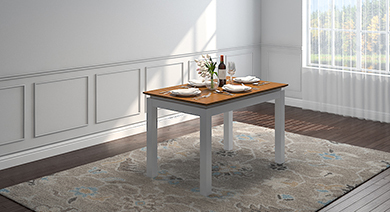 When planning the design and styling of your dining area, it is best to purchase a dining table set that accompanies your style of interior decoration. Shop online at Urbanladder.com and find the perfect 4 seater dining table set for your home. We offer you a diverse set of options in the dining table category in order to ensure that you find the right one for your home. For those looking to maintain the consistency of their traditionally styled homes, it is best to consider the Papilio range of 4 seater dining tables sets. This wonderfully crafted set is styled with minimalism to accentuate its great build and structure. It is made using high quality sheesham wood that comprises the frame along with veneer finished plywood panels for the table top. This set manages to easily blend into any home that focuses on traditional styling. Fans of contemporary craftsmanship will appreciate the build quality and styling of the Arabia square range of 4 seater dining tables. This particular set looks fantastic in design and styling with subtle understated highlights, showcasing the wooden grains on the surface. We also provide you with many modern and edgy pieces of furniture for the family that enjoys a distinctively styled product. The Abbot and Liana range of 4 seater dining tables are a breath-taking infusion of modern styling and brilliant craftsmanship. The Abbot range is made using high quality rubber wood with upholstered cushions for the seat and back. These sets are extremely comfortable as well and will go a long way in accentuating the dining area of the modern home.